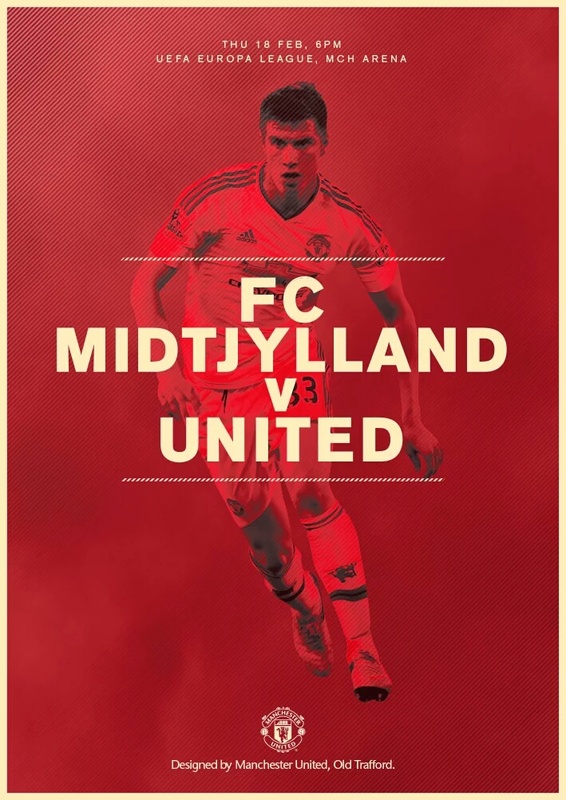 Tonight we face FC Midtjylland in the Europa league – a trophy which we have never won. This was a fact that Van Gaal was keen to point out in the press conference leading up to this match. Maybe he sees this as a silver lining to being relegated in the group stages of the Champions League? One thing is for certain though, we cannot go easy – as much as for pride as for the fact that a 4th place finish in the PL looks tougher and tougher every day and we need to have a contingency plan in order to make sure that we’re playing the highest level of European football next season. We come in to this match after a bad run. First we were robbed of 2 points at Stamford Bridge, and just last weekend we lost to Sunderland 2-1. LVG has been placed under growing scrutiny over the past 2 months over his future at the club. Many sources including Roy Hodgson have said that Mourinho has all but signed the contract, and while LVG has maintained that he has a good relationship with the owners, a failure for Champions League would surely mean that he is shown the door this summer. The injury woes for United continue as Rooney has obtained an injury at the weekend, with Van Gaal saying that he battled on but the injury may keep him side-lined for 1-2 months. Borthwick-Jackson is ill meaning he is not eligible to play which is a shame considering that he has really been ‘Sparkling’ when he has been attacking. 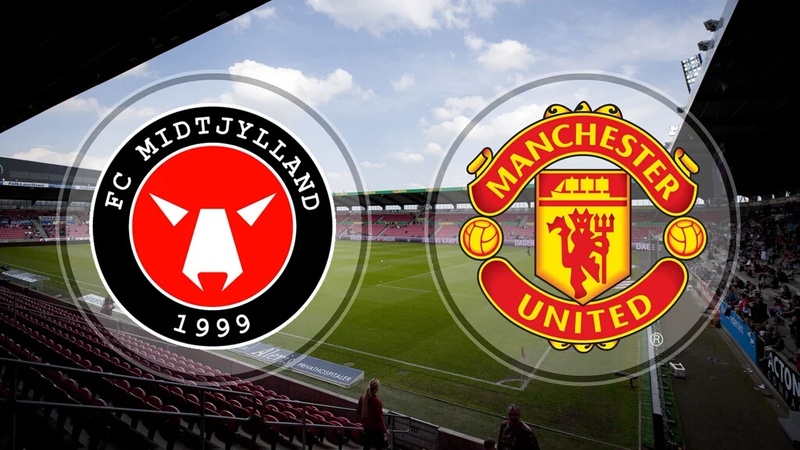 Fellaini is out with a ‘muscle problem’ and Darmian has a shoulder injury meaning he cannot play. This really does mean that we have no first team options for a full back position. We think that two U21 players will be called upon. It's most likely that Riley and Love will be played in the full-back positions today. This is also true for the striker role, where we could see Martial come into as he excels there, and Memphis plays on the wing. Another option would be Martial continuing on the wing and the youngster Will Keane in the no. 9 role. Only time will tell what option we pick. A big problem for us will be set pieces. FC Midtjylland have scored 48 times from set pieces this season. One way to combat this will be to defend them better than we did on the weekend, and the second is not to give them away in vital positions. I am given to understand that the opposition have a large team just for set pieces so it would be wise for us to pick some height in our lineup – it’s a shame that Fellaini had to be injured today of all days. Hopefully we can not only win today but put on a performance. 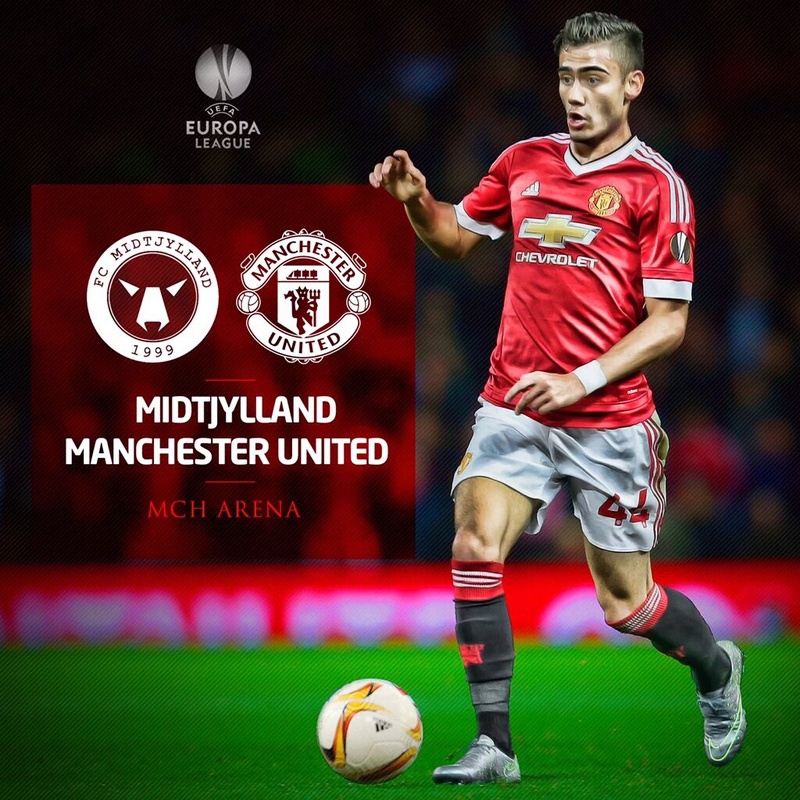 It’s time to bring some of that Red Devil fear back to Europe! I’m going to be bold and say a 3-0 win to us today (You heard it here first guys) and as always #GGMU! From a first-sight overview, the starting XI that Van Gaal has chosen, does admittedly raise concerns for me, and other united fans. 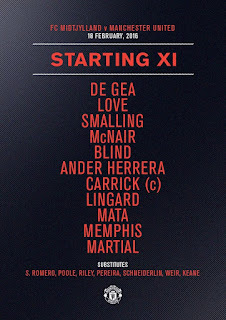 What this line up expresses is a lack of experience in a game, that for obvious reasons Man Utd are red hot favourites to win, nevertheless should still not take lightly and I feel that this is the case here. United have failed to win their last two games, however out of respect they should have picked up the three point at Stamford Bridge with only a moment of defensive incompetence hindering that. United then suffered loss to Sunderland a game which exposed the lack of effectiveness that some players in the team have. In the warm up for the game, David De Gea twisted his ankle and has been passed not fit enough to start the game. This is led to Sergio Romero being called up to start. This means that we have no other keeper if Romero gets injured or has to come off. Smalling has flourished this season and is starting to prove himself to be a decent defender. He says he is enjoying his football this season and I expect him to put in a shift tonight and lead that defence because his partner McNair again lacks the required experience which could prove to be decisive later on in the game. McNair ha gotten game time this season but this is a competition he has not yet played in and I have serious concerns about his place in the team but let’s hope he proves me wrong tonight. He is only a young again that’s a concern but that only means he has fresh legs and again he should put a shift in tonight. I expect Carrick as the captain tonight to put a real shift in the midfield and to command that team. In this team tonight he has the most European football experience and I expect him to use this effectively as to how he wants his team mates to approach the game. Carrick is virtually near retirement age and again I’m concerned slightly to whether he has the legs to carry that midfield enough. Herrera is a fantastic player who really should be playing more however Van Gaal has only introduced him into a couple of game as a substitute, I’m not quite sure how effective a tactic that is and there hasn’t really been evidenced that Herrera himself is enjoying camping on the bench much. Again here we have a fantastic player, a magician, a man who can make thing happen and keep that midfield ticking throughout the 90 mins. The goal scoring opportunities that United encounter tonight will be depended on how Mata’s performance is. If he’s good then we can expect a few goals but if its average I needn’t say what this means for United fans. A player who has been all out of sorts with his performances lately and throughout the season. It appears as if his confidence has taken a knock and he doesn’t really enforce himself in games as much and this has led to him playing in under-21 games which really isn’t a challenge for a player of his level. Lingard has been playing well in recent games. I’m not a big fan of his but he has been vital to some extent in the previous games, most notably against Chelsea. Martial will enjoy himself tonight hopefully as in the absence of Captain Wayne Rooney, he will be filling that vacant striker position which is his favoured position. He has been dangerous in previous games and so his form tells us, having scored in the past 2 games. He is really the enforcer of this team, he runs at defenders and gets opportunities, nobody else does this and it’s quite worrying that at only 20 years of age, fans have already placed such a large weight on his shoulders. Whether he can cope is another question but I expect him to score tonight and play well, judging on his performances I expect he will bag 2 tonight. The bench does lack quality I must say. I’m just surprised at the fact that Scheinderlin has been benched and has not been included in the first team. He is a useful player who is quite effective in midfield I must say, so we will have to see if his absence hurts United. The first half of this game and you can really see the attitudes the players are going in to this game with. The united players are not pressing hard enough and are not exploiting the massive gap the opposition leaves in their defence and if we did with the pace in the attacking four, the results could be devastating. The defence has been wobbly throughout the entire half. Smalling being paired with McNair, a walking disaster as seen in all the games he's played in so far for United. The amount of times the left back and centre back position have been changed is unreal and is a joke. There must be a shake up and review of the fitness instructors at Manchester United. From a careless pass from Carrick and a unwilling McNair they scored a pretty good goal. A piece of individual brilliance, the scouts must be pleased with that. Romero starts for the injured De Gea, and he's had a pretty good half except for the goal. He's made a couple of great saves and made United lucky that they are not 3-1 down. He made a great save on a 2v1 scenario but it could have been a goal of the attacker passed instead of trying to take the glory all for himself. Memphis has been characteristically poor, he's giving away possession with some sloppy passing but somehow he scrambled the ball into the back of the net. Completely undeserved. We need some more passion and aggression from the players and a new invigorated desire to win. We cannot lose to this side in this competition, not today, not tomorrow, not ever. An another abysmal second half performance from United. How is it possible that United were on the back foot since the ref blew the whistle indicating the start of the half? Onuachu's goal was stunning and what made it better was his overall performance. United made him look like Suarez, we couldn't take the ball away from him. Romero played pretty good and made another great save in the second half not including the goal. The opposition hadn't had a competitive match in 2 months. No attacking threat whatsoever, this is the Europa league is well. Our attacking players seemed dazed. They didn't have any creativity and no finishing. Our defence was even worse, every time they attacked us on the counter we seemed full of problems and gaps which they successively exploited. LVG didn't even change any of the tactics even though we were getting battered by the onslaught and instead subbed on Pereira. To improve we need a change in tactics and we need a leader on that pitch. The players really missed Rooney today, the moods were low and there was no aggression or desire to win. One of his best games in a United shirt, making some world class saves. However, he wasn't helped at all by the pathetically awful defence. He was the only player that deserved to wear the Manchester United badge today. It was the young lad's first start for Manchester United and showed today that he's not ready for first team football. Very much like the rest of the team, he under-performed. One of the worst games of the season for Smalling. He was not the leader in defence today and is continuing his poor form. Like the rest of the defence, he was poor and didn't attack the ball. He was caught ball-watching too often and wasn't good enough at all. Despite some decent runs forward, the final ball wasn't up to scratch. Also, defensively he was poor and didn't play well at all. This lad was meant to be the leader out there today, but he didn't put in a captain-like performance. We were dominated in midfield and constantly caught on the counter attack. Not a good day for the Spaniard. He's not been responsible enough in the middle of the field and has been too sloppy in possession. He had the chance today to show the manager what he has to offer but didn't manage to take advantage of it and was taken off early. A poor performance from our other Spaniard in midfield. His poor weak tackle led to the second Midtjylland goal. He was taken off early by the manager just after. Today's performance explains why Memphis hasn't been playing recently. He was poor throughout the game and didn't make much of an impact apart from his goal. However, he was often free down the left wing but it was the midfield's fault for not spotting him. He failed to produce magic today and didn't have enough shots considering he was playing as a striker today. Hopefully things will improve for him in the next game. A poor game for the young lad today. He started the game not too badly and put in a decent cross for Memphis to score the first goal but it went downhill really from there. Replaced Ander Herrera in the 70th minute and didn't make much of an impact. Replaced Juan Mata in the 77th minute and looked good on the ball, but it would've been good to see him get more game time. As we saw in the game United lacked experience to win in the game. 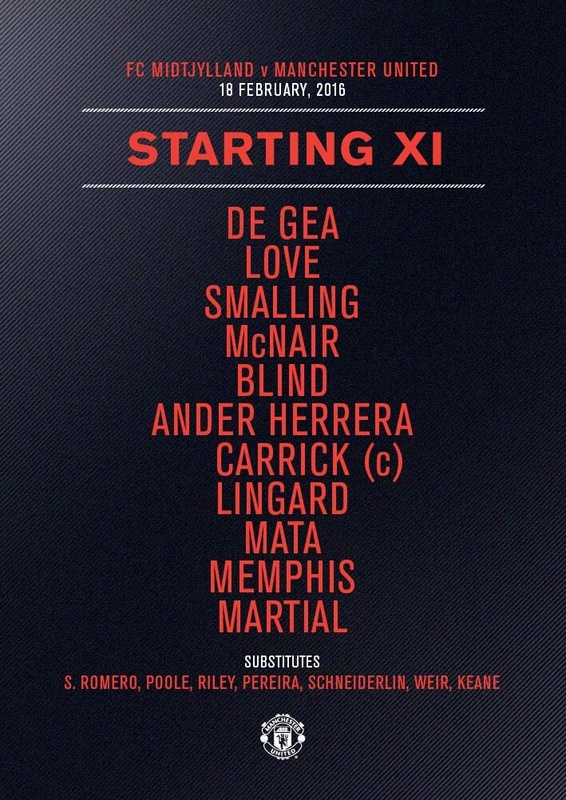 Just as predicted in the line-up analysis, the lack of experience in the defence from McNair and Love really cost United tonight and they were punished for it and rightly so. Disgraceful performance, I think that United came here expecting to just roll over their opponents tonight but I’m afraid it doesn’t quiet work like that and Van Gaal really needs to work out some new tactics, it’s quite appalling the way Man Utd. It’s quite interesting that just like at Stamford Bridge, when a ‘moment of defensive incompetence’ cost them the 3 points, the same happened here. Is this something that united fans can expect week in week out? I’m afraid it’s not looking good for Van Gaal, nonetheless blame must be shared between him and the players. Depay even though he scored tonight again displayed a confidence lacking performance, he repeatedly gave away possession with sloppy passes and this is just unlike him. I’m afraid this can only lead to the conclusion that there is a hint of morale deficit within the time and it is really hindering their performances. United play Shrewsbury next Monday and I really can’t see things drastically improving so for united fans out there, hold your horses and don’t come with any high expectations. Based on recent performances and what I have seen tonight, I think United will scrap a draw or lose to Shrewsbury. United simply need to get out of this habit of underestimating opponents.